This picture is very special to me. I spent many days walking along this road when I was but a mere youth. I had learned to ride my bike on this road. The field to the left of the picture, I had spent many winter days ice skating. Further up the road, I had spent much time poking in the stream looking for salamanders. Once, at the edge of the woods to the right, I all but ran into a black bear. He was busy munching on some leaves and I was frozen in fear. I finally managed to scream and he ran. Most importantly, on this road is where I would go to enjoy the presence of God. No one ever taught me how to do this, I just knew He was there. 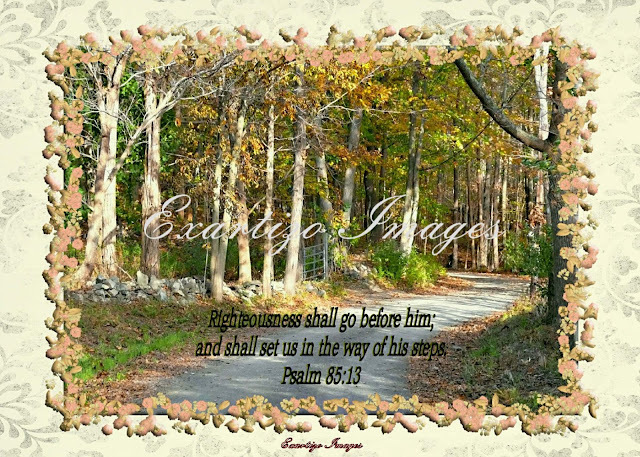 Remember your special place where "Righteousness went before you and set you in the way of His steps."